The Hills View Function Centre is a large hall located in Green Fields just off Salisbury Highway and only 20 minutes from the city. As the largest function centre in the area we are host to a range of causal and formal events including weddings, birthday parties, family reunions and hens/bucks nights. Our function centre is equipped with a fully stocked licensed bar along with a recently renovated commercial kitchen available for your professional catering company to hire for your event. Unlike other function centres in the area we do not charge extra for seating arrangements and provide ample seating for 150 guests and a maximum standing capacity of 220 guests. Complete with medium stage with PA hook ups (microphones rental $25 ea 4 available), free iPod connection/ CD player, large outdoor court yard, 50+ space off road car park, disco ball and a massive dance floor ! Our centre offers the best value money in the area. The Hills View Function Centre has the ability to become a blank canvas for you to create your perfect event ! Open regularly to the public as the Dutch Social and Welfare Club the club welcomes you to any and all social events such as free Family Days on the third Sunday of each month so you can view the property in your own time. Outside viewing times are available on Mondays 9am – 1pm, Fridays 9am – 1pm and some Saturdays by appointment only. 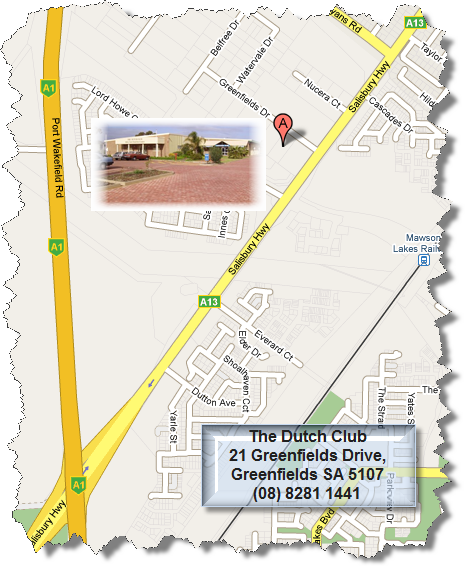 Please contact our Function Coordinator by email at Functions@DutchClub.com.au or call 0402 945 758. If you are interested in hiring the rooms for a wedding or other special party, please contact our function coordinator on 0402 945 758 or send an email stating, the dates, kind of party and your contact details on Functions@DutchClub.com.au. All prices include general cleaning fee (no confetti/ party poppers) and bar staff hire. All prices are subject to change depending on event type/ guest numbers/ date. Public holiday prices start at $600. High risk events (underage, formal after parties,18th and 21st, large numbers) many be subject to a $500 refundable bond or an extra $100 hall hire at the discretion of the function coordinator.